It causes me to wonder what other things foreign children and adults are chuckling about when they think of Americans. I can almost hear their snooty French accents as they gossip on their fancy French playgrounds: "those American kids think that Easter is about eggs. What's worse: they grow up thinking that rabbits lay eggs!" They probably laugh and laugh and laugh when they think of how stupid American children are. Before you dismiss me and my dismal blog post completely, understand the dark tunnel of deception from which I have emerged. All my life, I've mindlessly believed that there's nothing odd about a bunny carrying around eggs when rabbits do not lay eggs. Furthermore, my young mind is still trying to wrap itself around the whole egg concept anyway. Did somebody just decide one day, "Okay. So, Jesus died on a cross and rose again. We call that Easter. Because animals are being born when Easter occurs, lets hide eggs that could have been baby chicks, for children to find. That way, they understand that Easter is significant of candy and the dead potential for baby chickens. Brilliant!"? I realize I am hardly the first person to question this strange phenomena, but I also realize that there are probably others like me. There may be a whole handful of us who had no clue how weird this is, until a sibling brought it up, and rocked their entire world. We are launched into this confusing reality that rabbits don't even lay eggs-- and that our parents haven't put a stop to this nonsense (they've actually encouraged it!) At this point, they-- and myself-- are feeling like that lady from the recent Prego commercial, when she participates in a blind taste test and finds out that the pasta sauce brand she likes best is actually Prego. She is incredulous, "but I've bought Ragu for years! I wonder what other questionable decisions I've made..."
So I ask myself a similar question: what other questionable things have I believed it! 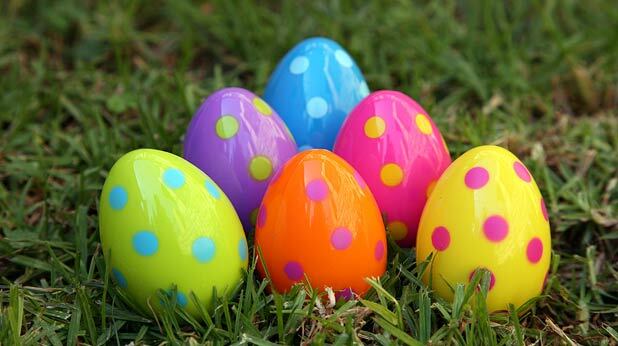 Do I know for a fact that these eggs that chickens lay, are even multi-colored when it is Easter time? Can I continue to simply assume that Jesus' okay-ed this tradition and asked for a chocolate egg alongside his Hissup branch with wine? Then I get angry. How was I deceived for so long? I didn't even think for myself! Now I must cross-analyze every holiday tradition that I have played along with for years. The idea that a rabbit steals chickens eggs-- on Easter nonetheless-- and delivers them to children, slipped by my radar. While I am aware by now that I have rocked your world as well as my own, understand I am not quite through. My reason for coming at you so squarely with this life altering truth, is to bring about change. I do not want to scare parents-- or alienate children-- but we need to take a close look at this "Easter bunny" and decide how he fits in to our Easter festivities. I cannot stress enough that we must carefully discern as we move forward, lest we aggravate this bunny, causing him to steal our unborn children and candy and set off a worldwide rabbit rebellion. Yes, I may be one of the only ones critiquing this "Easter tradition" so carefully, but I rest assured that I will also be the only one prepared with a tranquilizer, should the rest of you mess up and cause this rebellion in the near future. Happy Easter!